(Nanowerk News) A recent study ("Evaluation in a Dog Model of Three Antimicrobial Glassy Coatings: Prevention of Bone Loss around Implants and Microbial Assessments") performed by a group of scientists from the Nanomaterials and Nanotechnology Research Center (CINN) – joint center of the Spanish Council of Scientific Research (CSIC), the University of Oviedo and the Principality of Asturias – the Institute of Advanced Oral Surgery of Madrid (ICOA) and the Center for Minimally Invasive Surgery Jesús Usón (CCMIJU) has demonstrated the ability of three glass coatings, developed by the CINN, to control peri-implant infection and subsequent disease. The use of these coatings on medical implants decreases bacterial colonization and disease progression significantly, especially in the case of the bioactive glasses. 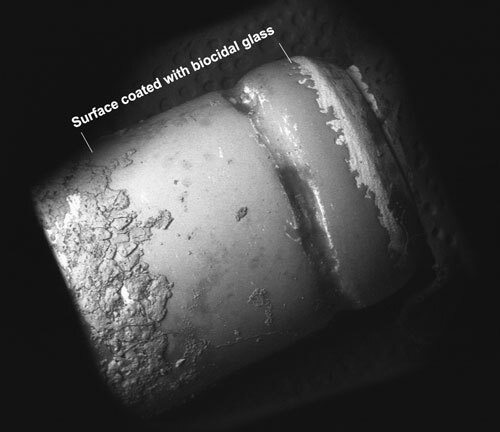 Dental abutment partially coated with antibacterial glass. The image shows how plaque accumulates on the uncoated area. Bacterial colonization of implantable medical devices – such as joint replacements (hip, knee, etc. ), metal heart valves, catheters, etc. – is a medical problem of great importance because of its prevalence (it is the main cause of failure of total knee arthroplasty and the third leading cause of total hip replacement failure) and its cost “apart from the economic cost for the health system to remove these devices – the cost of changing only knee and hip prostheses in the USA grew from 320 million dollars in 2001 to 672 million dollars in 2010 –, the patient pays a very high price health wise, which can even involve death in some cases”, says Dr. López-Piriz. Through a peri-implant disease induction model carried out in 5 dogs the study has shown that the application of bioactive glass as a coating on implantable medical devices inhibits the formation of surface biofilms “in vitro” and “in vivo”. One of the glasses, called G3, showed an especially remarkable ability to prevent bacterial colonization and slow down disease progression. Although research with these novel biocide materials has focused on the health field, Dr. López-Piriz says that: “There are many other applications for which they would provide significant advantages, such as in air conditioning devices where Legionella growth causes epidemic outbreaks and numerous deaths every year”.